Understanding larval dispersal requires knowledge of whether larvae in situ have orientated swimming, and how this varies temporally and spatially. Orientation of >300 settlement-stage larvae of Chromis atripectoralis (Pomacentridae) measured over 1998-2008 by divers near Lizard Island, Great Barrier Reef was consistent. All 10 data sets had southerly orientation at all locations; 94% of larvae swam directionally. Median bearings east and west of Lizard Island were 166° and 170°, respectively. Orientation precision was significantly higher under sunny than cloudy skies. Similar mean bearings were obtained in 2008 with more than 125 larvae observed in a drifting in situ chamber (DISC). Orientation varied with time of day. 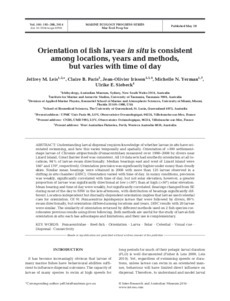 In sunny conditions, precision was weakly, significantly correlated with time of day, but not solar elevation; however, a greater proportion of larvae was significantly directional at low (<50°) than at high (>50°) solar elevation. Mean bearing and time of day were weakly, but significantly correlated. Bearings changed from SE during most of the day to SSW in the late afternoon, with distribution of bearings significantly different. Location-independent but diurnally-dependent orientation implies that larvae used celestial cues for orientation. Of 91 Pomacentrus lepidogenys larvae that were followed by divers, 89% swam directionally, but orientation differed among locations and years. DISC results with 20 larvae were similar. The similarity of orientation returned by different methods used on 2 fish species corroborates previous results using diver following. Both methods are useful for the study of larval-fish orientation in situ: each has advantages and limitations, and their use is complementary.